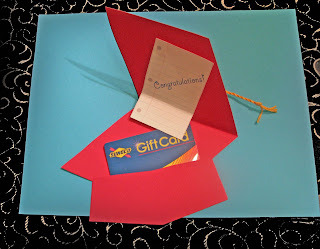 Fast and easy pop up gift card holder for graduation. When the card is opened the gift card slides out of the pocket. The template and instructions are on splitcoast stampers. (If this link doesn't work go to splitcoaststampers.com and click down through: Splitcoaststampers>Stamping Stuff>Downloads>Templates>Graduation Gift Card Holder). I tweaked the base of the cap a little to make it symmetrical, and made the notepaper and sentiment on the computer instead of drawing/stamping them. I also covered the brad that holds the tassel in place with a card stock circle "button". I found that you can cut two cards from a piece of 12" x 12" piece of card stock if you flip the template over. Bear in mind that if your card stock is patterned on only one side, one card will be "backwards". All that means is one will open from the right, and one from the left. No big deal. 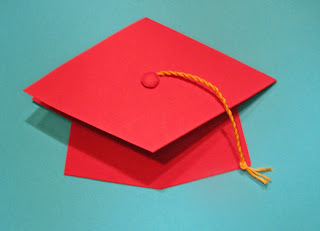 Here's another cute graduation cap card, from diy network.